This guy is missing a vital piece of protection. Eye injuries are among the most common types of work-related injuries, with about 1000 injuries occurring each day according to a report from the Electronic Library of Construction Occupational Safety and Health. With the proper eye protection and knowledge, you can protect yourself against eye injuries that may force you to take time off to recover. The first step to preventing eye injuries is making sure you have the right protection. 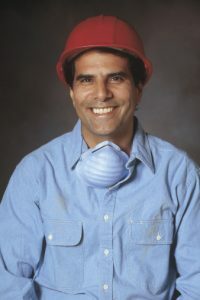 Eye protection should be appropriate for the job being done, and fit the wearer so that the eyes are totally protected. The majority of injuries occur when objects or chemicals go around or under the protection. Goggles are considered the best form of protection since they eliminate the possibility of objects or chemicals getting around the protection. Working overhead or working with power tools greatly increase the likelihood of an eye injury. Gravity is your enemy in the first case, as object are more likely to fall and come into contact with your eyes while working overhead. Power tools create dust and other particles that may be so small you don’t even see them. These particles are thrown into the air by the tools and can easily end up getting into your eyes if you aren’t wearing appropriate eye protection. If you or a coworker sustain an eye injury while working the number one rule is to not rub it. First, you should rinse your eye with clean water to try and flush out the object. Don’t touch your eye, as your hands could have more contaminates that could also get in your eye. The best thing to do is to notify someone trained in first-aid to determine whether or not you will need to make a trip to the emergency room. G & M Services is proud of our employees and the dedication they have for safety in the workplace. Our employees are also rewarded for positive safety practices. We also incorporate weekly and monthly discussions and meetings to ensure that all involved are aware of how to handle equipment and potential situations that could occur during a project. G & M Services offers services in the way of concrete drilling and sawing, concrete scanning, and FireStop. To get started with G & M Services, call us today at 410-787-8828 or visit our contact page. Follow the official G & M Services page today on Google+, Facebook, Twitter, and LinkedIn. This entry was posted on Friday, June 10th, 2016	at 5:21 pm	. Both comments and pings are currently closed.